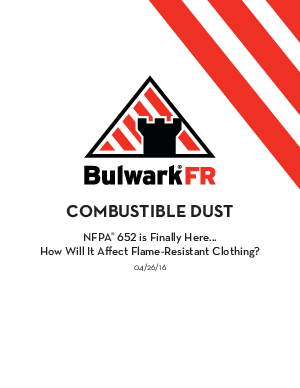 > Bulwark > COMBUSTIBLE DUST NFPA® 652 is Finally Here... How Will It Affect Flame-Resistant Clothing? Combustible Dust: NFPA® 652 is Finally Here…How Will It Affect Flame-Resistant Clothing? NFPA® 652 is the new standard published in 2015 regarding combustible dust (CD). While previous CD standards, including NFPA® 654, were inconsistent and industry-specific, NFPA® 652 is the first to provide a consistent and complete set of safety requirements across all industries whose processes cause a CD hazard. This white paper addresses the implications of the new standard for safety managers and will help explain how the new provisions may affect your business operations and FR safety programs.